The 33rd St Maarten Heineken Regatta concluded today in fitting style, with staunch and steady SSE trade winds of 15-20 knots, seas flecked with white caps, and superb Caribbean sailing. It was one of those yachting days made for superlatives, and official scorer and 'regatta guru' Paul Miller unleashed a torrent of them. The wind blew and blew hard at first. For the crews of the 202 yachts competing it was what they'd come looking for, and it was definitely worth the wait. After Saturday's race to Marigot, the fleet reassembled on the western, French side of St Maarten and with the wind gusting to over 20-knots, the race committees for both the A and B fleets sent the racers on challenging courses across the Anguilla Channel before a long upwind leg along the island's southern shore to a finish line off Simpson Bay. The B fleets that included all five Bareboat classes, Multihull divisions 3-5, and the Lottery Class sailed a 15 mile course starting in Marigot Bay. The Multihull 1-2 classes, and CSA 1, all competed on a 29.5 mile course that took them to a turning mark off Tintamarre before turning downwind into the Anguilla Channel; the other CSA 2-8 classes sailed a slightly abbreviated 22.5 mile race. The timing was such that the entire fleet converged on Blowing Rocks off the western point of Anguilla en masse. The B fleet spun around a turning mark just inside the reef, but the CSA and Multihull racing classes in the A fleet came ripping down the Anguilla Channel under spinnaker and rounded Blowing Rocks before dousing their kites and trimming on for the final leg to Simpson Bay. While several crews in some of the classes came into Sunday's racing with comfortable leads, there was plenty at stake for many of the competitors in several other divisions. In the CSA 1 battle between heavyweights, Jeremy Pilkington's Baltic 78 Lupa of London and Jan Rupert's Tripp 75 Blackbird came into Sunday's racing both with three points apiece. From the outset of the race, the two giants were locked head to head, effectively beginning what turned into a long, closely contested, point-to-point match race. In the end, it was Lupa's day to shine, and with a Sunday victory the sleek 78-footer reigned supreme in the big-boat class. CSA 3 was another class that was up for grabs on Sunday, and it was stacked with talent, including last year's recipient of the Most Worthy Performance Overall Award, Richard Wesslund's El Ocaso. But El Ocaso's uncharacteristic 14th on day 1 ultimately proved to be too high an obstacle to overcome, and in a major surprise, the boat was denied a podium finish. So on Sunday, in CSA 3 it came down to Sergio Sagramoso's J/122 Lazy Dog - a perennial Heineken Regatta contender - and a newcomer to the fleet, Greg Slyngstad's J/125 Hamachi. The latter sailed a tremendous race, and was the first of all CSA boats to round Blowing Rocks after flying down the Anguilla Channel under a huge, white asymmetric spinnaker. When the spray settled, Hamachi was second on Sunday, and Lazy Dog won the final CSA 3 race on corrected time. Remarkably, however, both boats were tied with identical scores of 15.5. But Lazy Dog's last day victory proved to be the difference, and the crew from Puerto Rico earned the title of CSA 3 champ. There was less drama in CSA 4 and CSA 8, but a pair of dominant showings well worth celebrating. In the latter, In the highly competitive sport boat class, Mark Plaxton's Melges 32 Team INTAC won all four races in the regatta to win the division in runaway style. Plaxton's stacked crew included this year's Budget Marine Match Racing Cup winner, Taylor Canfield, and four-time Canadian Olympic and Volvo Ocean Race sailor Richard Clarke. And in CSA 4, Han de Bruyn Kops's well-sailed Hanse 47e Team Han also swept all four of their races to easily win their class. In other CSA action, Richard Blakemore's Swan 53 Music put the finishing touches on a fine series on Sunday, winning their third straight race in a row to capture CSA 2. Raphael Magras's X-34 Maelia also took the final three of four to handily win CSA 7. In CSA 5, St. Maarten skipper Alain Riouallec's Sigma 41 Bachi-Bouzouk capped a consistent series with a fourth on Sunday that was enough to wrap up their 11-boat class. And with great scores throughout the weekend-including a first in Sunday's race-Remco van Dortmondt's Sunbelt Realty DASH, was the undisputed victor of CSA 6. Finally, in separate scoring for the six Melges 24s in the field, Andrea Scarabelli and Team Budget Marine/Gill topped the tight one-design fleet. Among the catamaran and trimaran fleets, the Gunboat Elvis-and there was a sighting of "The King" dancing on the foredeck moments after the start-was another boat that sailed a perfect regatta, notching their third consecutive first-place finish to win Multihull 1. Petr Kochnev's Lagoon 500, Belisima, also won their class, Multihull 3, in three straight sets. It was a far different story in Multihull 2, where Nils Erickson's Formula 40 Soma and Richard Wooldridge's tri Triple Jack came into Sunday's racing tied for first. 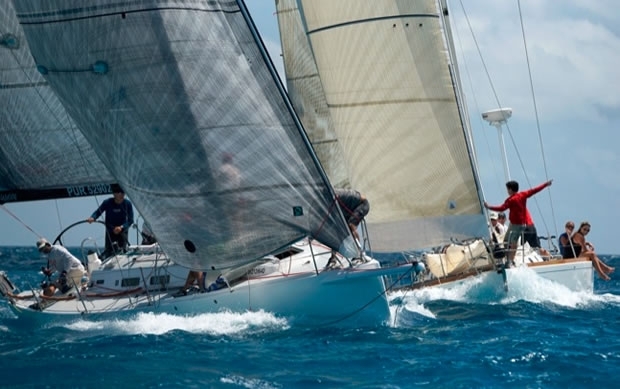 Both boats nailed their starts and, with hulls flying, tore up the coast of St Maarten nearly locked together. But Soma eventually pulled away and won both the final race and the class, while Triple Jack's fourth on Sunday relegated them to second in Multihull 2. Maas Hanen's Outremere Teora won Sunday's race in Multihull 4-their second win in three races-to earn top honors in Multihull 4. The MyCat 26 Carib Cat was the winner in Multihull 5.